When a household's money is tight, each day can mean a series of spending trade-offs that can have both short- and long-term effects on health and well-being. Starting in 2017, the YMCA of Western North Carolina has worked with MANNA Food Bank, Mission Health Partners, and local clinics to reduce the negative effect of food insecurity on patient health. The clinic integration pilot started with six Mission clinics in Buncombe, Haywood, and McDowell counties. In conjunction with the Food Research & Action Center (FRAC) and Feeding America, the American Academy of Pediatrics developed the Hunger Vital Sign, a validated and practical two-question food screening tool recommended for use in clinical settings and in community outreach. With this tool, a patient screens positive if they answer "often true" or "sometimes true" to either or both statements (listed below). By incorporating these simple screening questions into patient intake forms, practitioners at Mission Health clinics will be able to identify food insecurity onsite and direct patients to healthy nutrition resources. "Within the past 12 months, we worried whether our food would run out before we got money to buy more." "Within the past 12 months, the food we bought just didn't last and we didn't have money to get more." If a patient screens positive, they are immediately directed to the MANNA Helpline to be connected with possible food resources such as SNAP and will also be directed towards the Y's Healthy Living Mobile Kitchen where they receive free fresh, healthy food paired with cooking demonstrations and nutrition. This collaborative approach will give families experiencing food insecurity the resources and knowledge to lead healthy and active lives. 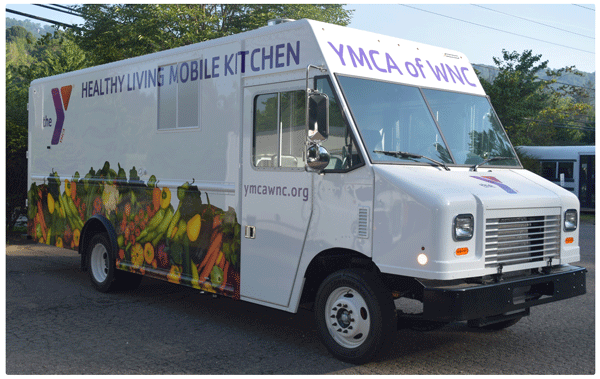 The YMCA, Mission, and MANNA hope this pilot will set the stage for connecting more clinics and patients across Western North Carolina with healthy food distribution partners. To learn more about these programs, please email us or call 828 775 7081.